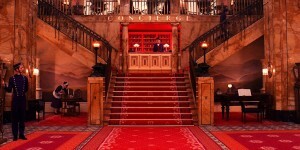 When we first see the Grand Budapest Hotel in Wes Anderson’s visually stunning new film of the same name, she appears a withered beauty during a flashback to the 1960s. The garish green and orange lobby sticks out like a dye job crying for attention. But then, as the film’s narrator, Mr. Moustafa (F. Murray Abraham), recalls the grand dame’s glory days in the ‘30s, when he worked as a hotel lobby boy, the camera races across a resplendent red carpets as if panning across the profile of a starlet. The solution presented itself during locations scouting in East Germany. Anderson stumbled upon the Görlitzer Warenhaus, an abandoned department store in Görlitz. This “tremendous find,” according to Stockhausen, made building an interior possible within his budget, and the production crew soon created an entire hotel lobby inside. Stockhausen and his crew—including prop master Robin Miller, set decorator Anna Pinnock and graphic designer Annie Atkins, who created all the film’s incredible typography from scratch—crafted the sets by cherry-picking the best of the best. 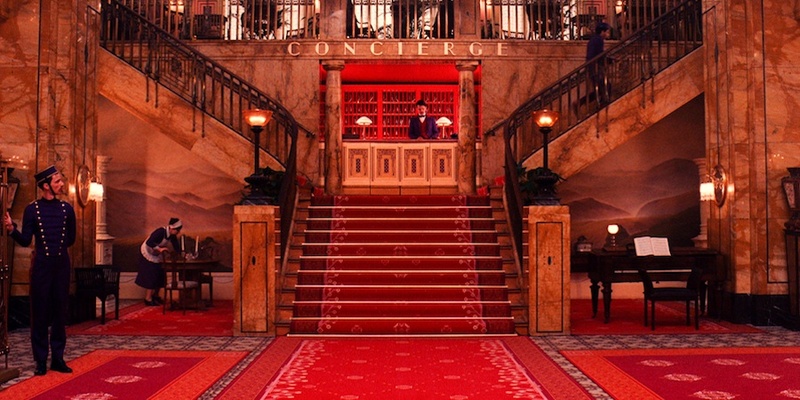 After extensive scouting trips and time spent scouring through old books and photos, elements from continental classics like Berlin’s Adlon informed the lobby layout, which included flourishes such as a coat check, lobby bar and barber shop. One place in particular loomed large as an influence: the Grandhotel Pupp, the gem of Karlovy Vary, a famed spa town in the Czech Republic that hosts an annual film festival. It’s part of a strip of pastel-painted buildings on the Slovenska River in the city center, all painted in shades of tangerine, pistachio and bright yellow ochre that inspired Stockhausen. He says the exterior of the Pupp is the biggest influence on the exterior of the Grand Budapest (which was created with a miniature), and the Czech hotel’s grand hallways and massive windows inspired the hotel sets seen in the film. Occasionally the references were from other films or artwork—the circular door patterns were inspired by those from the Ingmar Bergman film The Silence, the palm court took cues from Rousseau paintings, and movies like The Life and Death of Colonel Blimp and To Be Or Not To Be by Ernst Lubitsch inspired the mood of the interior. As impressive as the 1930s-era glory days of the hotel looked, the hotel’s ‘60s low point showcased a blockish, brutish, Soviet-era style—an interior that was “Eastern Bloc-ified,” according to Stockhausen. The film was co-produced with Studio Babelsberg, in nearby Potsdam, and Stockhausen utilized their prop warehouse to source authentic period colors and designs. He pulled out household items such as lamps, flashlights and walkie talkies and used them as examples. Those props, along with research on hotels in Yalta and Vilnius, informed the later period designs. Like many Anderson films, Grand Budapest Hotel traffics in nostalgia; multiple narrators explain, in great detail, their love and obsession with the past. It’s fitting that the sets and visual style of the film are such loving, gorgeous tributes.